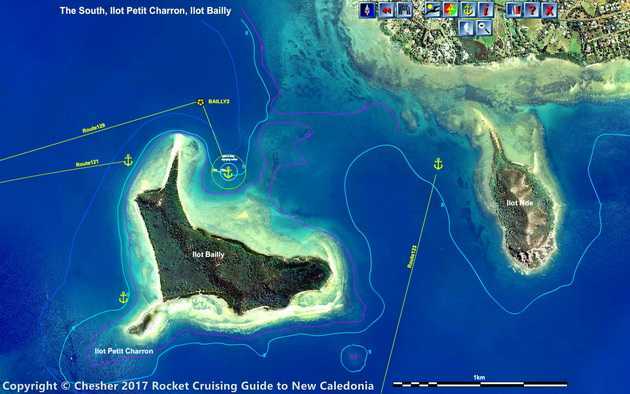 The Cruising Guide to New Caledonia has high resolution aerial images of 212 Anchorages in New Caledonia, from Huon Atoll d'Entrecasteaux in the north, to Isle of Pines in the south and including the Loyalty Islands and all regions of Grande Terre. You will find everything you need to know about every anchorage including precise sailing directions with GPS coordinates, depths, reefs, nav aids and lights, and nearby treks, shops and fuel facilities (if there are any). The guide also includes virtutal reality sphere images of many anchorages that let you see the anchorage as if you were already there. New Caledonia Lagoon Island from the Rocket Cruising Guide to New Caledonia. In the companion travel guide to New Caledonia you'll find out where to rent cars in New Caledonia, arrange for a tour, go diving with a dive operator, and enjoy a perfect meal in a great restaurant..